Unlike past recommendations of mounting two ‘snow tires’ to wheel drives for the winter, Apple Valley Auto Repair recognizes that vehicles need four matching tires. They are to be the same type and model. The same degree of wear is also important. When the four tires behave the same way; cornering, braking, and accelerating is predictable and balanced. If any of the factors, mentioned above, are different, traction characteristics vary, and unbalanced performance takes place. Thirty-seconds of an inch are the units used in measuring the depth of tires. New tires typically have ten to 12 32nds of tread. If a tire loses two to four 32nds of the original depth, replacing just the damaged tire is acceptable. Apple Valley Auto Repair and some all-wheel-drive vehicle manufacturers recommend replacing all four tires because new tires have an overall diameter that is larger than the tires already used. Those tires that lost some tread depth spin faster than new tires. It is possible for the difference to cause the engagement of the all-wheel-drive system on dry pavement and damage the system. Ideally, all tires on four-wheel-drive and all-wheel-drive vehicles have the same diameter and the same amount of traction. Similar guidelines apply to front- or rear-wheel-drive. When half or more tread wears from tires, the replacement of just one tire results in that wheel spinning slower than the others. This spinning imbalance has the potential of sending false signals to antilock brake and traction control systems. A tire having more or less traction affects cornering grip, braking, and acceleration. 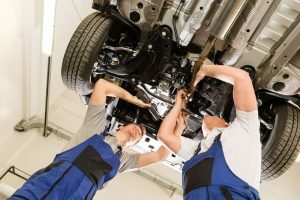 Replacing both tires on the same axle of two-wheel-drive vehicles is a better approach than just one. It is still best to replace all four tires when there is significant wear on the old tires. 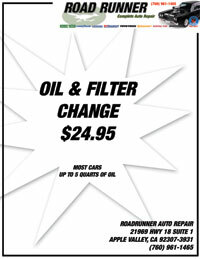 Apple Valley Auto Repair knows of another method that prevents buying more than one tire. Matching the tread of a new tire to match the depth of the used tires is a possibility. If replacing only one tire, the tread pattern, size, and model of the other tires is important. Different brands and models differ in revolutions per mile and traction. Likely, wear occurs at a different rate. It is conceivable that one tire wears faster than the others. That wear is possible on a tire having more tread depth than the others. Whether replacing just a single tire or more, Apple Valley Auto Repair advises new rubber mounting on the rear. Mounting on the front makes worn rear tires more susceptible to riding on top of road water, called hydroplaning. Hydroplaning is sometimes the cause of a vehicle spinning in a turn.